Tate Liverpool has announced an upcoming event starting from 29th May to 13th September 2009 addressed to all graphic, fashion and interior designer. 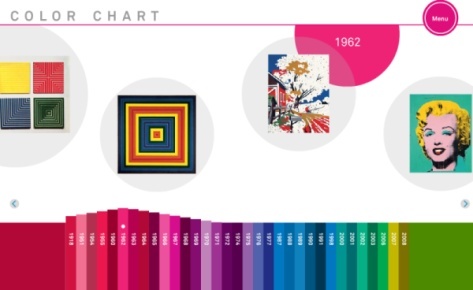 The exhibition Colour Chart: Reinventing Colour, 1950 to Today will show role of color in these main areas of desing from post-war to nowadays. Taking the commercial colour chart as its point of departure, the exhibition emphasises a radical transformation in the post-War Western art that is characterised by the departure from such notions as originality, uniqueness and authenticity. Colour Chart celebrates a paradox: the beauty that occurs when contemporary artists assign colour decisions to chance, ready made source, or arbitrary system. Colour Chart is really the first major exhibition devoted to this pivotal transformation and offers an alternative survey of mid to late twentieth-century art, emphasising the significance of colour as an indicator of shifting conceptions around art, commodity and creativity. Exhibition has been organized by Museum of Modern Art (MOMA) of New York and will feature more than forty artists, including Ellsworth Kelly, Andy Warhol, Gerhard Richter, Frank Stella, Yves Klein, Richard Serra, John Baldessari, Dan Flavin, Damien Hirst, David Batchelor, Jim Lambie, Angela Bulloch and Cory Archangel. Colour Chart: Reinventing Colour, 1950 to Today was curated by Ann Temkin, Curator of Painting and Sculpture at The Museum of Modern Art, New York. At Tate Liverpool the exhibition is organised by Christoph Grunenberg, Director, and Sook-Kyung Lee, Exhibitions and Displays Curator. visit Tate GallerY Official Website HERE. While we’re waiting for this event to happen in Old Europe, we can watch dedicated space (a flash website you can preview in pic) of the exhibit that already took place in New York 2 March to 2 May 2008.